And why, oh why...don't we talk on the telephone with our friend Antonella, who's notoriously very chatty, while the stew is "not slowly cooking" on the stove? Good that we have non sticky pots, because the non sticky layer could never be brought back to its "splendors"! Like the time I put my eyes on a nicely wrapped Japanese candy and - sweet junkie that I am needing a sugar boost - I tried it, just to find out that it was a "sour plum" salty candy. Yes, yak! Of course there is a zillion small number of bad ideas coming from an irresponsible little spirit dwelling in me (else a responsible and quiet person). I swear I was decently dressed: no naked body parts, nor inviting attidudes. It was just the wrong place at the wrong time of the day (for someone the right place at the right time of the day!). The other very good idea I had (seems that weird things always happen at the station) was NOT to wait for some friends with whom I had an appointment. I just decided to "find" them, because I was sure they had arrived earlier than me (ah ah ah ah, never suppose such thing again!) and they were bored. So, I ran around half day and - eventually tired and desperate - I got back to the station and...waited! Miraculously these friends arrived, after "their" day tour. Of course, at that point it was time to take the train back home for everybody. And since I never met them again this was really stupid of me! So, have you ever had bad ideas or even good ideas which turned into a failure/disaster/fun story? This is not a confession of someone who desperately wants to write a book. I don't want to write a book (not now, not here, not yet, not in English...). There are people out there who should write and I am more than happy when I can enjoy their writing and their efforts: thanks, good job, I feel inspired and happy and motivated. Anyway: if I had to choose a book I might write (or have written), what would it be about? Probably about bathrooms. Beautiful bathrooms. ...Maybe with a chapter or two about hamam and ofuro (お風呂). There are books though, which kind of fall in my hands - that's the ultimate divine (cloud swallowing light) bookstore experience - at the perfect time, when you just needed them. To make it clearer, I don't believe in "the latest, the greatest" when it comes to books; I read what I feel I need to read. So, I happen to find a book I haven't read yet and I totally have a revelation: suddenly everything is clear to me, suddenly I know who I am and what I want (basically everything - let's admit it) and my understanding of the world is radically changed. Books (different books in different moments of my life) are like intense meditation to me. Do you have a similar experience with books? Or is there a special activity that helps you cope with the doubts and troubles of your mind? if you're on your way. This post was supposed to be totally different. But I found this flower to be pretty inspiring...I might not like November, but I will see it from a different perspective. This is the time of year when you can hear the Grouchy Smurf in me talking. Have I already mentioned how much I hate November? The leaves are falling, it rains... it's getting colder AND darker and I hate it. No matter what I do or with whom I am. Or what I eat, if it helps. I didn't like it as a single, nor when I was in a happy relationship and less than that when I was about to break up - which just seems to go together perfectly with this month. November is the month of the dead: it will always be for me. It's in my DNA, in my memories and it takes all of my efforts to think about whatever positive things. It's not only the bad mood about myself and the things I didn't accomplish in the previous months, but also about what's coming next. My body hates that there are going to be layers and layers of clothes on it, the extra 10 pounds that make the difference! Going out will take longer (especially with kids), it won't be as fun and there are going to be days where I am literally stuck at home (like today, because I don't find the car key) or when I will find an excuse not to go out if not strictly necessary; as if that inner Smurf refused to even think about having fun. This year November is going to be tougher than ever, with our upcoming move back to Europe. I refuse to talk about that, because I will be emitting negativity and it wouldn't be nice of me. It's really a physical reaction more than a rational one, but knowing this doesn't help having control over it. The Grouchy Smurf totally possesses me, maybe I need an exorcist. Generally people say "you are what you eat", so if I said that last night I ate boneless chicken breast, mashed potatoes and steamed veggies...you'd probably suggest it's time for the geriatric care. This post isn't about food, in fact. It's about what I see from my window. Or from my windows. I like to think that the weather and landscapes are an extension of our feelings and of our state of mind. I take pictures not to show people places, but to remember how I feel in a certain place and what the impact of a color or of a certain place has on my mind (you can call it soul, it doesn't make a big difference to me!). When I'm in Italy, visiting my family, I always sleep in my old bedroom. It's probably not the biggest but it's still THE ROOM with the best view. I took this picture two years ago, when there were some major road works to build a highway few feet away from our house. Now the works are completed, so I can see the highway (which makes me totally mad), but yes, I can see the country and the mountains, too. 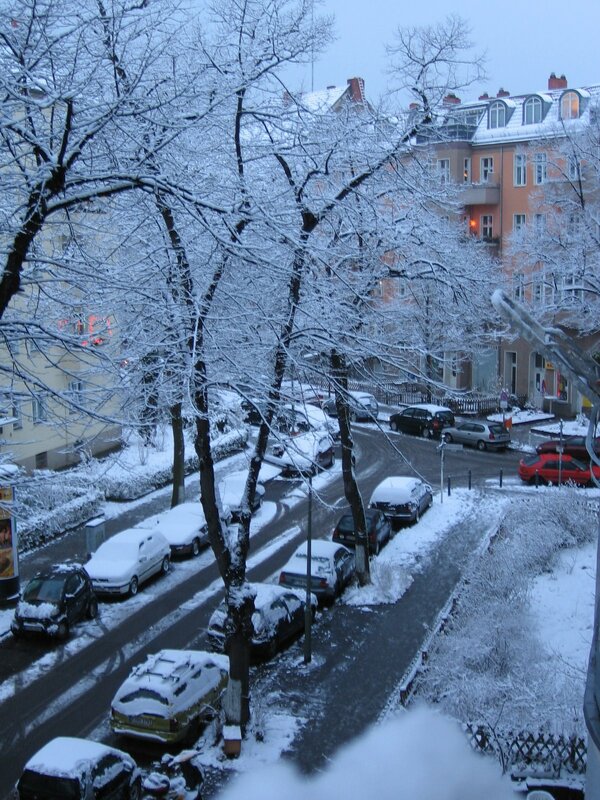 This is Berlin from our living room - another winter picture, I know but ...it's November, so expecting to find flowers in bloom would only be some kind of perversion. Our street is very quiet: cars are parked and - despite the two lanes - only one car at a time can drive through. Most important detail is that I can see if the bakery is still open when I crave for Schokocroissants too early in the morning or too late in the afternoon! Last, but not least, this is the winter view from our second floor here on Long Island. If I said "I see the Sound" you might think I am being a bit rhetoric, but the poetry of it is not in the words. It makes me kind of sad that I will not see "the other side"; I always fantasize about the distance separating people who are in fact very close. This is actually true for all my windows. As it is true that I am never staring for a long time, nor spying on people passing by. You can always see me wave, though. Maybe a childish gesture of mine. Nevertheless I wave, 'cause you never know...someone might wave back and smile.